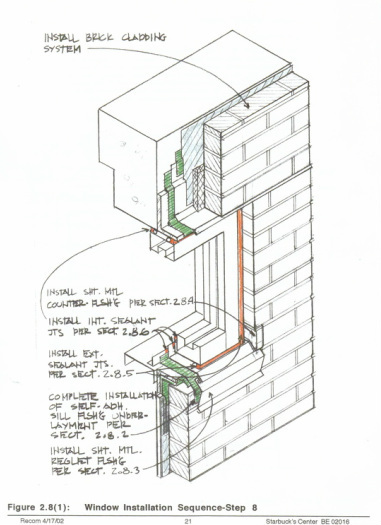 To limit cost, PL:BECS provided hand-sketched, step-by-step installation details for critical envelope elements. Project Summary:	This historic retail building, which originally housed a Sears retail outlet, was being remodeled to serve the needs of its new owner, Starbucks Corporation. As part of the extensive remodel, the building’s entire exterior envelope was being replaced with a new brick veneer cladding with store-front window systems. PL:BECS Services:	PL:BECS provided detailed guidance to Turner Construction Company in the proper design and installation of the new brick veneer cladding and store-front window systems. The recommendations included hand-sketched, sequenced installation details for major cladding elements, including all aspects of the brick veneer and the windows. PL:BECS also provided limited review and guidance for window installation mock-ups.